If you could build the ideal multi-industry global conglomerate from scratch, scaling it to over 700 product families, would you let each one of those 700 product managers target the same customer separately? Why then do so many enterprise brands find themselves in a similar pickle? Three years ago, the Cisco marketing team woke up to this real-life situation. 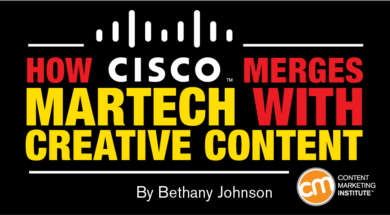 Bob Meindl, Cisco marketing director, and Jenny Hooks, Cisco marketing manager, describe the revelation in their joint 2018 Intelligent Content Conference, Beauty and the Beast: Creating the Balance Between Content Innovation and Martech Capabilities. Unfortunately, the disconnect led to multiple marketing programs within Cisco targeting an individual prospect from many angles, resulting in an experience that looked fragmented, felt uncoordinated, and even sometimes delivered conflicting information. The solution they found flipped the “create content first, ask questions later” approach all too common at Cisco – and so many other companies. Putting content creation last ended up helping the team scale its processes and end the confusing experiences that sprang from muddled marketing silos. Are Organizational Silos Keeping Your Content Marketing Team From Success? All product managers consider their widget customer-centric because it solves a client’s problem. Of course, they’re right. But what often emerges from that mindset is the impulse to develop content about how the product helps the customer – and then figure out who to target it to. While many content marketers know to start with the customer when creating their strategy, many product marketing-driven B2B organizations struggle to start their content planning from that perspective. Cisco’s CMO tasked a team of 20 marketing and communications leaders from across the company to set out to reverse the framework and create a genuine audience-first model instead. 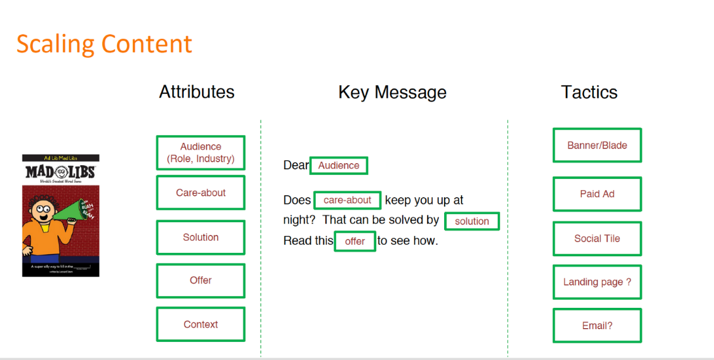 Today, the content process starts with a detailed analysis of the audience before any content gets created. The marketing function rallied around the customer-centric perspective from the executive to the individual contributor levels. In-country teams added writing capabilities and built digital marketing functions from scratch. “This was a huge change for us, putting the customer at the center of everything,” Bob says. The framework appears simple, but in practice the many decisions and people involved complicate the process. If you implement it, expect hurdles and snags, Bob and Jenny say. But stay committed to the process for the benefit of your customer. Here’s how. We all have misconceptions about who our audiences really are and what they truly want. Marketers project attributes, pain points, and desires onto their ideal persona instead of uncovering true “care-abouts,” as Cisco describes them. With that information, Jenny’s team was equipped to create a smart channel strategy that meets those customers with the right content, through the right channel, at precisely the right moment. Accommodating a seamless experience across channels means meeting contacts where they are instead of creating something and hoping to lure eyeballs toward it, Jenny says. That’s the difference between a successful omnichannel strategy and wasted activity. Designing a personalized red-carpet experience for everyone in your database, no matter how manageable the list, would be overwhelming. That’s why a few priority personas and channel strategies should reach the right people on the right platform. 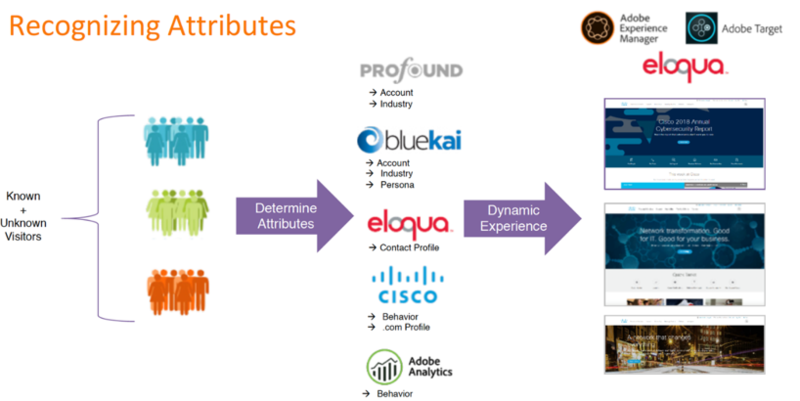 Based on those personas and channels, you can devise an effective individualized message. By approaching your messaging through personas instead of products, you can find common threads and develop content that speaks to those commonalities. How? With intelligent content. Some of the commonalities between personas can be surprising. For example, you wouldn’t expect a CIO, a data center manager, and a network buyer to display the same digital behavior, but even though they have differing motivations, they sometimes tackle top tasks similarly. Another example is security. Across every career level and loyalty tier, and in every sociogeographic group, the demand for more security content is great. Until recently (and it’s still common in many enterprises), this knowledge would have triggered Cisco’s marketers to create a flurry of security content creation and distribute it. The sweet spot is the artful intersection between visitor value and brand value. When one of the site’s 14 million unique monthly visitors lands at Cisco.com, it’s an ideal opportunity to nail it with on-domain, rule-based personalization, and relevant, dynamic content. The scale of Cisco.com’s traffic (millions of visitors and local language content and offers for 84 countries) makes it nearly impossible to offer truly one-to-one personalization. Targeting by country is the first step; eventually, the team hopes to be able to target by industry and other attributes, and by behaviors. A campaign ID ties to the overarching message. The drive-to ID shows the channel the customer engages on. An offer ID holds the metadata for the specific content (industry, theme, products, and persona). The IDs help the team understand which content visitors engage with and what channel they’re coming from. When they found one of their personas was 800% more likely to engage with Cisco content on social media than other buyers, the team responded by building more social-led content to serve that segment. Bob and Jenny shared an example of one of Cisco’s personas to show how the new process revolves around the customer rather than the products. Meet Nigel, a network buyer whose perspective and needs are sussed from the buyer persona research. Nigel’s main concerns include simplification, future-proofing, and security. 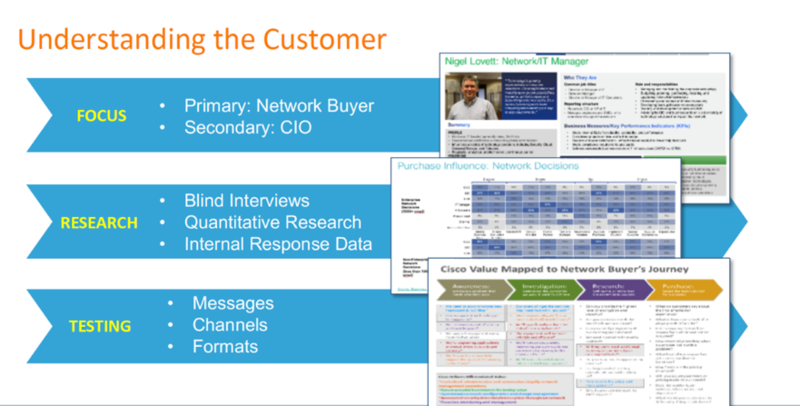 With that knowledge, Cisco creates themes for each stage of Nigel’s buying process and messaging for each theme that works across business units, sales, services, etc. 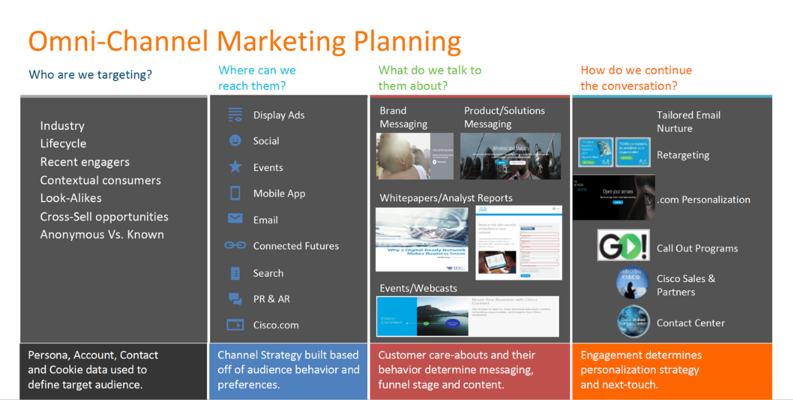 Where Cisco once had marketing plans based on products, it now presents the customer concerns and asks the product teams what they have that addresses those concerns. That information leads to the prioritization of messages and offers based on revenue opportunity or alignment to things the customer cares about. Many marketers think personalization tricks are so nifty that there’s no wrong way to use them. Too often, we create content and then personalize it for the sake of personalization, not truly for the benefit of both audience and business. To rescue a team that has fallen into that unproductive tendency or to avoid the pitfall in the first place, take a page out of Cisco’s playbook. Put the customer before everything — even above the content — and both your audience and bottom line will benefit. Empowering new tech tools and innovative processes are clearly distilled and explained by content strategy practitioners and technologists at CMI’s upcoming ContentTECH Summit. Sign up here to be notified when registration opens for this inspiring event. Bethany Johnson is a multiple award-winning content marketing writer and speaker. Her work empowers marketers to rethink interrupt advertising in favor of original content that converts passive readers into active followers. Brands like MasterCard, ADP, Fidelity, and Philips rely on Bethany’s voice to connect with audiences daily. For more, visit bethanyjohnson.com. Follow her on Twitter @thanybethanybe.